Grow and Business Opportunities for Licensed Realtors. What's in it for you? Why join the MoguLife® Real Estate Family? When you get your real estate license the courses do not teach you how to get business. You have to learn how to build your business on your own or with the help of a mentor. Here are a few things a new agent will learn from a real estate team. There are many companies out there who promise great leads to agents. Some of those lead sources are okay and some are a complete rip off. A new agent can easily go broke trying out different lead sources. The best way to build business is not from buying leads, but from building a database from people you already know. MoguLife® Real Estate and the Perry's Realty family will help you decide where to spend money and which programs are worth paying for. A great real estate team will also provide training for new agents. We host team meetings every week with training sessions. We can host daily meetings when production demands to increase your performance. We have successful realtors and investors discuss lead sources, how to talk to clients, how to talk to new leads, what you can and can’t say, how to prospect, how to work with investors, and much more. We teach our agents how to handle inspections, appraisals, loans, closings, contracts, the MLS and more. Our team teaches agents how to build a database. We teach our agents how to meet people, how to contact people, who to contact and how to follow-up. This is the most important part of being an agent and new agents have no idea how to get started with it. The MoguLife® family is a real estate who will help build your business and provide a brand and system of success, propelling your business out of the ordinary into the extraordinary. In a word, we partner with you to build a "mogul life" in business, real estate, and lifestyle. 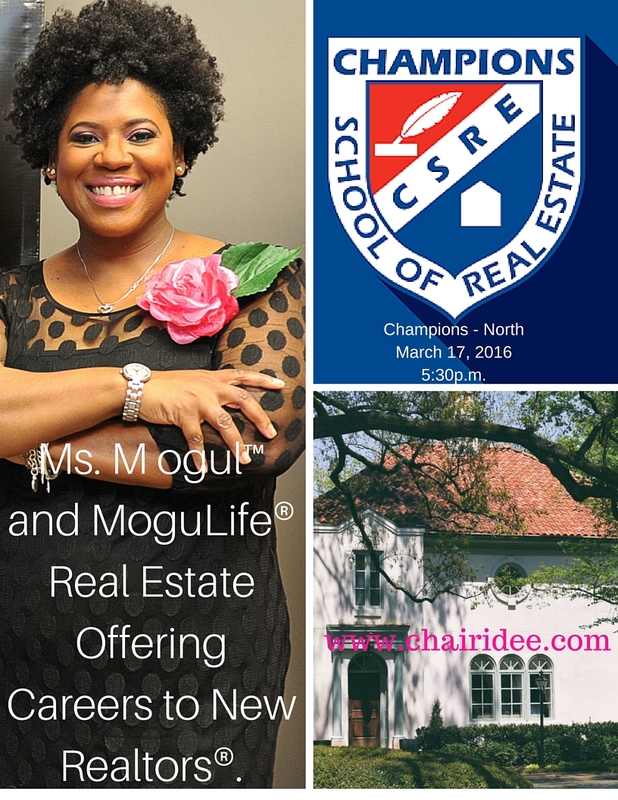 To join Houston's winning team, please contact Ms.Mogul™ at 832.910.7093 or email at MsMogul@chairidee.com. MoguLifeTV­® - "Ladies, Get in the Game of Home-ownership and Investing!" Watch our recent interview above with Nancy Furst, 2015 Chair of the Board for Houston Association of Realtors. Become a Mogul as an Unlicensed New Construction Sales Agent. There are a plethora of opportunities to grow your business success and bottom line in real estate, particularly in Houston. Working with builders as an unlicensed agent is one such opportunity. Each builder’s commission rate is different. For example if you sell a 250k home, at 1.75 percent commission, you take home $4,375 – and you do not split that with anyone. Some builders even provide, health insurance, 401k, and other benefits. Secondly, unlike many realtors and brokers who can pay astronomical prices for adequate marketing materials, working for builder, you do not! … And customers actually walk through the door! No hard prospecting! Partner with a licensed MoguLife® realtor, and open another pool of income just waiting to resourced! We’ll teach you new construction sales “how-tos” and the “tools of the trade”. Builders are in the market for polished, professional, knowledgeable professionals who will connect their product with the right buyer, moving inventory, making sales! You can help a home-buyer obtain their definition of a “mogul life” with defining your own in new builder sales. Partner with MoguLife® and we’ll show you how! Contact the office today at 832.910.7093 or email us at MsMogul@chairidee.com. "We pledge a couture approach to business and service for our clients." - Chairidee Smith, Ms. Mogul, CEO and Founder of MoguLife®.